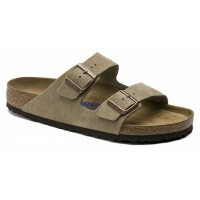 Limited edition by Birkenstock. Two band slide with adjustable buckles. Suede wrapped insole with arch and metatarsil supports. Cork midsole. Rubber sole. 2 inch heel.